All about my day in Tokyo with Accessible Japan and how it got me thinking about disability issues in Japanese tourism. 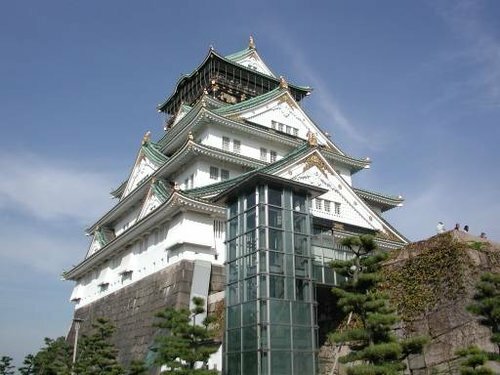 Osaka Castle has a major design flaw. Not a military or structural weak point, but an aesthetic one. The castle keep rises magnificently on top of a high hill, a proud symbol of power and might communicated through traditional Japanese architecture. But next to it looms an elevator shaft encased in a steel and glass tower that looks like a mini office building. Frankly, it’s really ugly, and the historical castle with a modern elevator attached to it has become something of a joke among both tourists and locals. What a shame! This beautiful building has been tarnished with a device for lazy tourists! Remove the elevator to preserve the traditional look! These are the usual comments you hear at this site. I, too, shared those sentiments until recently, when I met someone who got me thinking about accessibility at Japanese tourist locations. The majority of people don’t give much thought to accessibility, which refers to not only how locations accommodate visitors using wheelchairs, scooters, or crutches, but also the steps taken to assist guests with visual, auditory, or other impairments. In America, the 1990 Americans with Disabilities Act brought this topic into the public consciousness and sought to improve the quality of life for the disabled with new rules on discrimination and public facilitates. This was about the time that you started noticing ramps and wheelchair-friendly bathrooms becoming common nationwide. Nowadays, a wheelchair user can enjoy many of the same facilities as everyone else. But things are not so great over in Asia. As developed as Japan is, it’s still behind the times when it comes to accessibility, especially in terms of wheelchair-friendly locations. Every few months, I get an email asking me about accessibility in Kyoto, and my lack of knowledge and understanding of the topic was embarrassingly minimal. 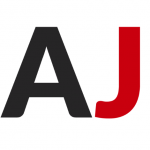 After some googling, I discovered Accessible Japan, a deeply informative website focusing mainly on travelers who rely on wheelchairs to get around. 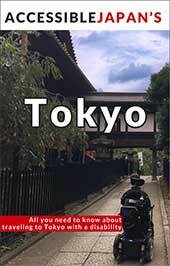 It’s run by a Canadian expat Josh Grisdale who now resides in Tokyo as a Japanese citizen. His site really got me thinking about Japan travel in a whole new light. As a wheelchair user, Josh experiences Japan in a completely different way from me. From the obvious stuff like buildings with no ramps to getting stares from locals (foreigner and disabled is a pretty unique combination here), Josh has experienced it all. I met up with him recently in Tokyo for a day of sightseeing where he showed me a bit of what daily life is like for him in Japan. 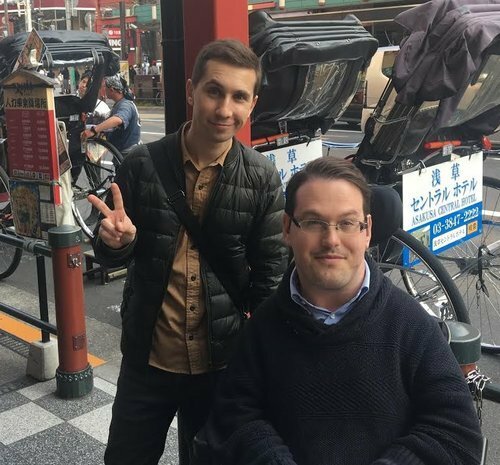 What I discovered surprised me, and reinforced the central idea that he tries to convey on his website: Japan is not as difficult for disabled travelers as you might think. With a little research and prep work, Japan can be an exciting and comfortable travel destination for just about anyone. I asked Josh a few questions regarding his feelings about accessible travel in Japan and disability in general. Terin Jackson: Improvements have been made in recent years, but why do you think Japan has been so slow to adapt to the needs of the disabled when compared to America or Europe? Josh Grisdale: I think that Japan has been slow to start, but quick to catch-up and in many cases surpass the west. One reason is perhaps that there aren’t any strong rules with penalties to promote accessibility – in the public sector, it has mostly been guidelines and suggestions. But thanks to a vocal disabled community, and a graying society with ever increasing mobility needs, Japan has been on the fast-track to improve accessibility. Even in the 10 years I have lived here I have seen amazing changes and gained the ability to experience more of Japan – including its many tourist sites. TJ: Do you have any words of advice for disabled visitors who are considering traveling to Japan but are unsure of how comfortable they will be here? JG: I think research is important. 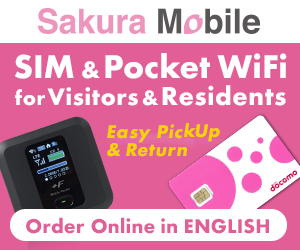 Definitely check out Accessible Japan! But additionally, use Google Street View. Most roads in Japan are covered, so you can check out routes and even many tourist attractions before you go. I use it often and it is invaluable for seeing things like if a restaurant has steps or if the suggested route to a hotel is wheelchair friendly. YouTube can also be a great help as many people have put up videos that you can use to get an idea about accessibility – even if that wasn’t the poster’s intended purpose. When you look at the material Josh’s website provides, it’s easy to understand how a disabled visitor in Japan can have a relatively similar tourism experience here as anyone else. Sure, some places and activities are off limits, but I found the accessibility in Tokyo to be impressive and efficient. Josh showed me the process of riding on a subway as a power wheelchair user. I’ve seen plenty of wheelchairs on the train here in Kyoto, but never saw the process all the way through. We notified the station staff at the ticket window, paid the regular ticket price, and waited while a station worker guided us down the elevator to the front of the train. Josh was able to roll into the subway car thanks to a portable ramp the staff laid down over the gap, and we were off. At our destination, another worker was waiting to help us disembark, and then walked with us out into the station where he handed us off to a waiting staff member from the other train line that we were transferring to. It was all bows and smiles and “sorry about the wait and inconvenience” from all the workers we encountered. There was a bit of waiting involved and it certainly took longer than a normal commute, but the overall efficiency and willingness of the workers impressed me. As we toured around Yasukuni Shrine in central Tokyo, Josh pointed out the ramps allowing him access into the public areas. We had to walk for a while before we finally got to a spot where he couldn’t go any further: an unpaved path into a garden that featured stepping stones through a pond. End of the line for wheelchairs, but we were still able to enjoy almost all of the other grounds at the shrine. Josh also pointed out the gravel patches in the shrine. These are common pitfalls at almost all Shinto shrines, where the pathway to the main building is traditionally lined with loose gravel. Some wheelchairs have problems making it through deeper gravel, but there seemed to be paved areas that we were able to stick to for most of the shrine. Yasukuni Shrine seemed a model of modern accessibility in Japanese public spaces. I wanted to see something a little more challenging, so we headed over to Sensoji Temple in Asakusa, a lively tourist area under the shadow of the Tokyo Skytree. Nakamise Dori, the busy shopping street leading up to the temple, was jam packed with tourists and making our way through the crowd was slow going. What struck me most about our time at Sensoji was how Josh handled the crowds. It didn’t phase him. If you had asked me if a wheelchair user would be able to tackle the busy shopping area in front of the temple, I would have advised them not to bother. Nakamise Dori is famous for its wall to wall crowds, and the same goes for the narrow, cramped walkways of Nishiki Market in Kyoto. I would have discouraged wheelchair users from visiting these attractions, thinking that the crowds would be too much to deal with. But crowds have nothing to do with accessibility in these cases. If a wheelchair can navigate through the area with no hindrance by steps or barriers, the location is accessible. My own bias that a wheelchair in a crowd would be a pain to deal with clouded my judgement regarding how accessible places are. It was a bit of a humiliating moment when I realized this. After all, Josh had just as much of a right to be there as everyone else, even if his chair took up more space than the average person. As Josh continued to point out small details, I began to understand the layout of the temple from a new point of view. I passed over a small 1 inch step in front of the temple gate, not initially realizing I left my friend behind. Josh informed me that the tiny step could be a roadblock for certain wheelchair types. Moving around a group of people was a few simple steps for me, but then I looked back and realized Josh was unable to follow due to the gravel surrounding the pathway. When I returned to Kyoto, my experience with Josh forced me to reexamine the temples and shrines that I visit on an almost daily basis. Could wheelchairs safely access the dirt walkway at Fushimi Inari? Is the hill in the bamboo forest to steep for a manual wheelchair? And what about guests who can’t transfer to the wheelchair provided by the temple at Sanjusangendo? 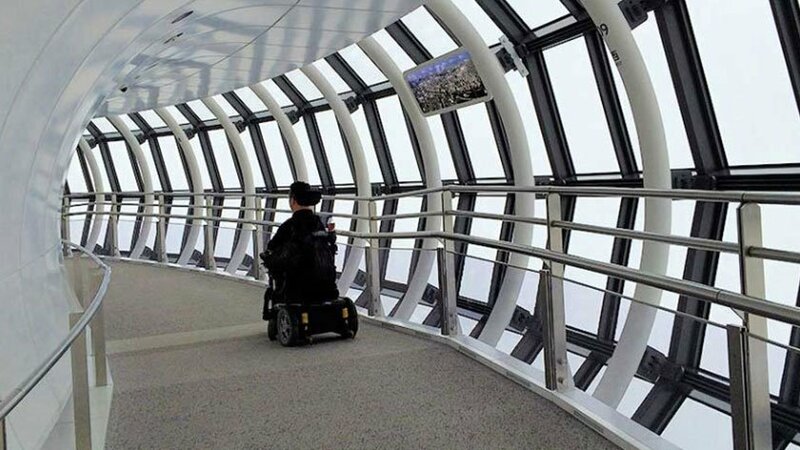 Some things are obvious when considering accessible travel, but others are virtually invisible to people who don’t deal with those sorts of issues in their daily life. I realized that I need to take a more careful look at the places I take guests to and better understand the challenges that disabled travelers face. Josh’s words on how non-disabled people should take a greater interest in accessibility issues also got me thinking in a new way. TJ: Most people don’t think about accessibility as a wide-reaching social issue. Do you think non-disabled people should pay more attention to accessibility issues? How can you get people interested and involved when it doesn’t affect them on a personal basis? JG: It’s true, most people don’t think about it until it hits a bit closer to home. Most times I hear about accessibility from a non-disabled person is when they have been injured and didn’t realize it could be so hard to get around. While it would be great for everyone to have their eyes opened to the topic, I don’t recommend getting injured. One thing I have noticed here more than other places is how accessibility benefits more than just people with disabilities. Mothers with babies use the special toilets, the elderly use elevators… it touches every stage of life. I think that the best way to be conscious about accessibility is to think “could I bring my grandma?” “if I had a small child in a stroller, could I get in this store?” etc. One day, it may be important for you yourself – we don’t stay young forever! Also, make friends with people who are disabled – I assure you your eyes will be opened when you just try to do regular stuff! So I can still laugh at the ugliness of the elevator tower at Osaka Castle, but now I understand its importance. That historical site has made a HUGE aesthetic sacrifice (trust me, you gotta see that hideous thing) for the sake of accessibility. If anything, Osaka Castle should be considered as the symbol of the changing consciousness on accessibility in Japan. It’s a slow process, but when they decide to adapt to the needs of the disabled, Japan has the ability and desire to go all out. The process of making the country more comfortable for disabled visitors will continue in the future as Japan prepares for the Olympics in 2020. The accompanying Paralympic Games is already changing the attitudes of Japanese and bringing disability issues to the forefront of public discourse. It appears that Japan is on course to make a huge shift in accessibility over the next few years.